Efflorescence is seemingly endemic with all types of concrete paving and while its presence on a recently laid patio or driveway can disappoint the homeowner, they sometimes feel that the usual disclaimer from the manufacturers "efflorescence is a naturally occurring phenomenonâ€¦ ... blah, blah, blah ... can accept no responsibility ... blah, blah, blah ... will disappear in time" is less than re-assuring and to some, it reads like a cop out, an excuse, a way of washing their hands of what is, after all, a visually distressing and disappointing problem. To be fair to manufacturers, they are stuck between a lump of concrete and a hard place. Try as they might, there's very little they can do to control the appearance of efflorescence, and what few technical fixes are available do tend to be employed by many of the better manufacturers. It's in their own interest to attempt to minimise the incidence of efflorescence, but even if they used every trick known, if they use efflorescence-reducing additives in the freshly mixed concrete, if they introduce steam to the curing chamber, or whatever other strategy is employed, there is no way they can guarantee that efflorescence will not be a problem with their products, because efflorescence is a naturally occurring problem and the chemistry involved is complex, involving a number of factors over which neither the manufacturer, the contractor, nor the homeowner has any control. So: what can be done to reduce the visual impact of efflorescence, or to speed its departure? There's a wealth of anecdotal advice out there, much of which is dubious, while some is downright dangerous, but there are some tried and tested 'tips of the trade' that are worth trying, even if they don't completely resolve the problem. Efflorescence is different things to different people. To the manufacturers, it's an insoluble problem; to the contractor, it's something else the client can blame on them; to the homeowner it's a white-ish discolouration that can appear to be like a powder or like the soapy scum seen on dirty bathwater, while to the chemist, it's most easily described as Calcium Carbonate with lesser quantities of other carbonate, sulphate, and chloride salts. 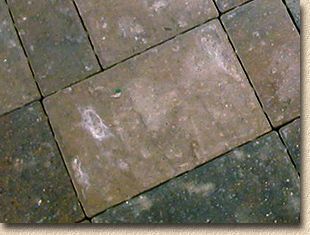 The bulk of efflorescence seen with concrete paving is Calcium Carbonate, whereas for clay pavers, the main component is usually Sodium Chloride - table salt - along with sulphates and some carbonate. The remainder of this section focuses on Calcium Carbonate efflorescence observed on concrete products, as that is the most common form. 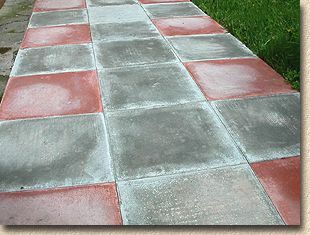 BS flags can be prone to efflorescence because of their relatively high cement content In simple terms, Calcium Carbonate is a by-product resulting from an interaction between the cement used to manufacture the paving and the natural environment, which includes the ground, the weather, and the atmosphere. 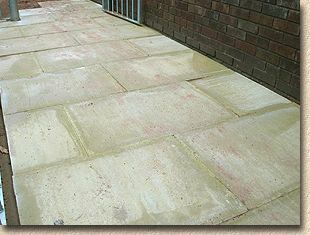 The result is a deposit or 'salt' that appears on the surface of the paving. There's no single, definitive appearance - it is sometimes powdery, sometimes scummy: sometimes it's hazy and indistinct; sometimes it's sharp, crisp and obvious. Sometimes it covers large expanses or paving, sometimes it affects individual units, and sometimes it affects just half or two-thirds of a paving unit. It seems to affect dark hued pavings more than those of lighter tones, but the truth is that it's just more noticeable against a darker background. However, it's always white-ish, although it might be a grey-white or a bluey-white, and it always spoils the looks and the colouring of the paving. 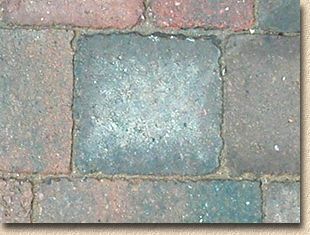 It may seem to disappear when the paving is wet â€“ this is due to water turning the efflorescence salts temporarily transparent rather than actually removing them. Once the surface dries out, the efflorescence salts usually re-appears. Concrete is made using cement, and cement is made from limestone. Consequently, all concrete pavings contain a quantity of lime, or Calcium Oxide (CaO) to give it its Sunday name. Better quality paving materials are manufactured using a better quality concrete, which usually has a higher cement content relative to 'budget' products, and so, perversely, efflorescence can affect the better quality products more severely than the 'economy' alternatives. Some manufacturers try to work around this by replacing some of the cement content with alternatives, such as Pulverised Fly Ash (PFA), which 'sets' much as does cement, but contains little or no lime. However, PFA is difficult to colour, so while its use may reduce the problem of efflorescence, it can increase production costs because of the higher levels of colouring agents required. So: this carbonation of the Calcium Hydroxide results in the insoluble Calcium Carbonate being dumped on the surface of the paving while the water simply evaporates away. It is this Calcium Carbonate that forms the white deposit that is the most visible indicator of ongoing efflorescence. The problem is that this transition from insoluble to soluble is slower than the preceding transition from soluble to insoluble, so there is a 'stockpiling' of excess insoluble material, which is the white deposit seen on the surface. As the concrete cures, some of the mix water reacts with the cement to produce Calcium Hydroxide, which, being water-soluble, can be transported to the surface of the paving unit during the curing process, and when the water evaporates, the Calcium Hydroxide is left behind. As curing of concrete is a long, drawn-out affair that goes on for weeks or months (long after the concrete itself appears to be â€œsetâ€�), the chemical production of Calcium Hydroxide continues, although it does 'tail off' as more and more of the original Calcium Oxide is hydrated. 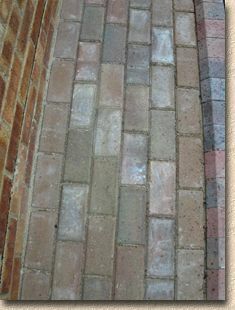 This is known as Primary Efflorescence, defined as efflorescence occurring as a by-product of the manufacturing process. It usually (but not always) appears pretty evenly over the entire surface of affected units. As many paving units have a relatively short turnaround (from fresh, plastic concrete in the factory to being laid on site can be as little as a week!) curing will be ongoing after the paving is laid, and as it is now exposed to the atmosphere and all that lovely rain, there is more opportunity for Calcium Hydroxide molecules deep in the structure of the paving unit to be dissolved and transported to the surface. This is Secondary Efflorescence, defined as efflorescence enabled or exacerbated by the penetration of water from sources other than manufacturing. As the occurrence and movement of this â€œsecondaryâ€� water is highly random, affected by time of year, location of the site, parking of cars, shelter from adjacent buildings, proximity to open ground and a whole host of other factors, secondary efflorescence is usually (but not always) of a more random appearance, seeing to affect some blocks more than others, and some not at all. So: the key 'ingredients' needed for efflorescence to bloom (as it is known) are Calcium Oxide, Carbon Dioxide, and Hydrogen Oxide (more commonly known as water). The extent of any efflorescence is largely determined by the presence of more or less of these key ingredients, and certain atmospheric conditions that can speed up or slow down the chemical reactions involved. While the vast majority of the Calcium Oxide will come from the paving itself, it may also be present in the laying course material, especially where a mortar, concrete or other cement-bound bed is used. Similarly, water comes not only from precipitation, that is, rain and snow, but also from the ground beneath the paving, from the atmosphere (as dew), from washing the car, or from watering the lawn, as well as being a vital component of the original concrete. The Carbon Dioxide is ever-present in the natural atmosphere, but there may be environments where levels of CO2 are higher or lower than normal either due to local natural phenomena such as vegetation, or managed environments such as curing chambers. As mentioned in the chemistry lesson above, the white bloom is gradually converted to a soluble compound that is simply washed away by the weather and/or a hosepipe. However, there are other factors that act to reduce or remove the visual impact of efflorescence. The tiny pores and voids within the concrete matrix through which the soluble Calcium Hydroxide is transported eventually become plugged with deposits of the insoluble Calcium Carbonate. This effectively blocks the escape route for the Calcium Hydroxide and 'locks in' any further reactions, forcing them to take place below the surface and, conveniently for us, out of sight. 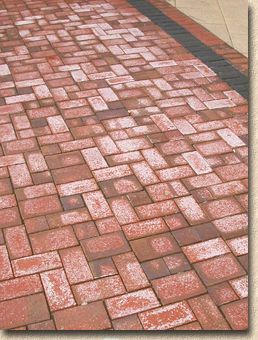 Simply walking over or driving on the paving will abrade the deposit, wearing it away and reducing the quantity visible on the surface. Although we know that rain can dissolve and wash away the soluble products of efflorescence, it can also wash away some of the insoluble material, in the same way that sand or other detritus can be washed from a surface. Other weather phenomena, such as wind, snow, hail, etc., can also accelerate the removal of both soluble and insoluble matter. Rain that is slightly acidic is better able to dissolve the deposited salts, and so the problem may disappear sooner in urban areas than would be the case in rural locations. This is the tricky question. No-one can say how long any incidence of efflorescence will last. It might be a few weeks; it might be a couple or three months; it could be a year or two. There are so many factors affecting its generation and appearance, and its disappearance that an educated guess is the best we can manage. We know that certain conditions have an effect: damp, shady sites can be more adversely affected than open, sunny sites, and, for some reason, the phenomenon always seems worst when the daffodils are out, which must be linked to climatic and ground conditions in some way, but no-one is really sure how. However, such an answer doesn't do a lot to dispel the legitimate concerns of the homeowner. They've handed over a big wedge of money for a patio or driveway and it looks, to be brutally frank, bloody awful. 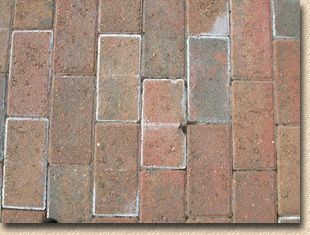 Judging from the feedback received at the Pavingexpert website, most cases of efflorescence become noticeable 3-6 weeks after laying is completed and then last for 3-6 months before gradually disappearing over a period of 3-6 months. It seems that most people never notice it coming â€“ it just 'appeared' overnight - and most don't notice its departure: one day, they realised that it's no longer there and they'd almost forgotten all about it. These figures are averages: don't complain to me if yours lasts for 2 years, and don't come crowing if it's been and gone and done it in a fortnight. That's the nature of the beast: it lasts as long as it does and it goes when it's done. Can it be shifted more quickly? Obviously, manufacturers and suppliers of the various wonder treatments have a vested interest in declaring their jollop to be the best, the fastest, the most effective, but how can that be proved with something so apparently random? There's no doubt that some of the proprietary products do remove the visible salts from the surface of the paving, but it is a temporary fix â€“ the problem is very, very likely to return. Any 'chemical' treatment needs to be considered very carefully and tested on a discreet area before daubing it all over the rest of the paving. Many of these products are based on a mix of detergents and acids that 'eat' or 'dissolve' the insoluble carbonate and allow them to be washed away. However, some acids may also react adversely with pigments used to colour concretes and can result in alarming colour changes. Further, they can actually exacerbate the problem by un-plugging the blocked capillaries and micro-pores which then allows the Calcium Hydroxide to find its way to the surface once again. Although stone products tend not to be affected by efflorescence, they may be used in conjunction with or adjacent to areas of concrete or clay paving, and acid-based products may cause dramatic discolouration or damage to the stone. A non-chemical strategy involves regular brushing and rinsing with clean water. This helps remove both soluble and insoluble products of efflorescence and may actually accelerate the eventual permanent disappearance of the deposits. 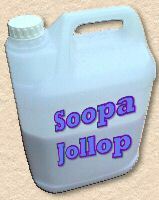 There have been suggestions that a few drops of wash-up liquid added to each bucket of water can also help. As more and more of us acquire power washers, these are increasingly being used in the battle against efflorescence, but it's uncertain whether they help or hinder. There's no doubt that they can and do remove some of the deposits, but they can also damage the surface of the paving, especially when used regularly on wet cast flags, and there's a suspicion that the powerful jet of water may un-plug the pores within the paving. Their use is probably worth considering once or twice per season where deposits are heavy, as they can make a dramatic improvement, albeit temporary, but regular use is probably detrimental. Mechanical methods include sand-, grit- or shot-blasting to remove the efflorescence deposits, along with a thin layer from the surface of the paving. This strategy is generally unsuitable for residential paving as it degrades the surface, which is, from the viewpoint of the homeowner, the most important part, but the strategy is used on some commercial projects and on troubled areas of in-situ concrete. There's a train of thought that runs something like this: The efflorescence is unsightly, but it is less noticeable, or disappears completely, when wet ... so, if a sealant was used to give the paving a permanent wet look that should eliminate the problem. The flaw in this argument is that "wet-look" is not the same as "wet". There's a whole range of different sealants, but for the purposes of this discussion, they can be divided into two camps: those that form a 'film' on the surface of the paving, and those that penetrate and form a more considerable barrier extending several millimetres into the paving. Those sealants in the 'film' camp are generally ineffective against efflorescence as the process continues and the carbonate material is deposited beneath the thin layer of sealant. The penetrative types tend to be more successful because they block the pores of the paving near the surface, thereby limiting ingress of water and carbon dioxide, and egress of calcium carbonate, which often remains trapped within the paving unit. However, the accepted wisdom is that it is much better to delay application of any sealant until efflorescence has dissipated. It's deemed better to allow the process to exhaust itself and therefore be fairly certain that most or all of the unsightly deposits are gone before spending money on a sealant. After all, a few weeks or months of what is relatively minor visual inconvenience is preferable to years and years of being faced with 'preserved' deposits, of efflorescence trapped and protected beneath a sealant. With block paving and other flexible segmental paving that uses sand joints, it's never a good idea to seal a pavement too early in its life as there needs to be a period of joint stabilisation, time for the jointing sand to settle and self-seal before 'fixing' it with a sealant of some sort. As long as there is 'free' Calcium Oxide in the system, whether that is within the paving units themselves or the bedding, efflorescence may continue. However, it may be taking place on such a relatively small scale that it's hardly noticeable, and it may seem the problem has 'cleared up'. Eventually, the supply of free Calcium Oxide will fizzle out and the efflorescence will be at an end, but hopefully, the visible effects will have all but disappeared long before then. How can efflorescence be avoided? The homeowner is powerless. There's nothing they can do that will have much of an impact on whether or not efflorescence becomes a problem. They are limited to dealing with the problem if and when it occurs. However, the manufacturers and the installation contractors can take steps to minimise the potential for problems, but there is no way they can eliminate it completely. -	reduce the amount of water used in the concrete mix, and so minimise the opportunity for Calcium Hydroxide to migrate during the initial curing process. -	employ additives that work within the fresh concrete to minimise formation of the salts. -	control the curing process by adjusting temperature and humidity levels within the curing chamber. -	slow down the curing process to encourage formation of the insoluble Calcium Carbonate within the paving, and so create an internal barrier to migration of dissolved salts. 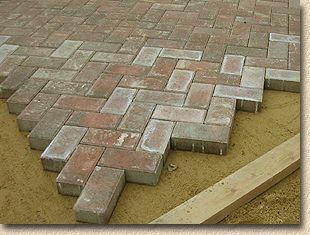 -	control packaging to ensure the paving is kept 'humid' during the first week or so of the curing process. -	control pre-delivery storage to ensure optimal conditions that minimise formation of excessive condensation which returns water to the paving and so promotes migration. This is mainly achieved by keeping the newly manufactured units in a dry and well-aired but not draughty environment that removes condensate before it has a chance to re-enter the paving. Many of the better manufacturers employ some or all of these strategies, as well as using their own 'secret' methods. When products develop a reputation for having high levels of efflorescence, they tend not to sell as well, and generate more customer complaints and negative feedback for the manufacturer. Stockists are in the front line of supply, and they often bear the initial brunt of a customer's ire. So, if a particular product or manufacturer is perceived to be prone to problems with efflorescence, the stockists are less inclined to carry those lines. Overall, it is in the interest of the manufacturer to do as much as is practically or economically possible to minimise the problem, but as has been stated again and again, they can not be expected to completely prevent it any more than King Knut could be expected to prevent the tide coming in. Contractors have less influence, but there are steps that can be taken to reduce the potential for problems, the most important of which is the choice of laying course material. Mortar, concrete and other cementitious bedding can contribute Calcium Hydroxide to the system and this additional material can be carried into and through the paving units by water wicking its way to the surface, driven by capillarity and evaporation. This can be a serious problem on wet or damp sites. Where a cement-bound bed is necessary, the risk of contributing to efflorescence can be minimised by using as little cement as possible and by using as dry a mix as is feasible. Two common misconceptions often encountered on patio construction are the beliefs that a 'strong' bedding mix is required, and that the bedding needs to be wet so that it bonds to the flags. On such projects, the bedding needs only to be stabilised; that is, there need be only sufficient cement to bind together the laying course material and prevent it being loosened and removed by groundwater, invertebrates or trafficking. It does not need to be as hard as iron â€“ a mix ratio of 10:1 is usually more than adequate for patio construction. Similarly, there's no great need for the flags to be 'stuck' to the bedding. A properly constructed bed will provide even, uniform support for the whole flag, with the entire base of the flag in contact with the bed, generating significant 'friction' between the flag and the bed. This factor, combined with the 'interlock' provided by adjacent flags, is usually sufficient to resist lateral (sideways) movement of the flags, although flags laid to free edges may need some additional restraint. A further way in which the contractor can inadvertently contribute to problems with efflorescence is by using frostproofers or accelerators in the bedding and/or jointing materials. Many of these products are based on a solution of Calcium Chloride which introduces yet another source for Calcium Hydroxide as well as providing Chloride ions that are able to form additional salts on the surface. As mentioned, the efflorescence process affecting clay products is slightly different to that discussed for concrete products. 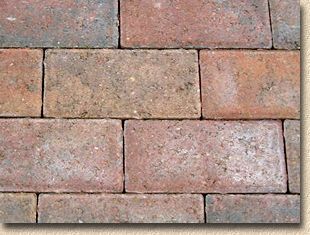 Clay pavers tend to contain very little free lime (Calcium Oxide) but may contain small quantities of other soluble salts, notably Sodium Chloride and some sulphates. With certain types of paver made from specific clays, there may be some deposition of metallic salts, such as iron, manganese and vanadium. These can be deposited on the surface of both rigid and flexible clay paver surfaces in much the same manner as already described. However, the 'wicking' effect is of more relevance as salts from the bedding materials are dissolved in the groundwater and then readily absorbed by the porous paving bricks before being deposited on the surface as the water evaporates. Again, the deposits can be washed off with a stiff brush and clean water, or left for nature to sort out. On flexible pavements, heavy deposits can be dispersed with the aid of a dilute acid wash. Unlike concrete products, the colour of clay pavers is natural, permanent and unaffected by low-strength acid washes, but care is still needed and any acid-based treatments are best used as a last resort and as infrequently as possible. 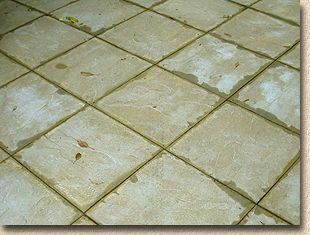 Most manufacturers of clay pavers do not recommend the use of acid-based cleaners, and it's worth following this sound advice. As it says in all the manufacturers' brochures, efflorescence is a natural phenomenon and is best left to resolve itself. It's not pretty but it doesn't actually do any long-term harm to the paving and in the vast majority of cases it will be over and done with in a few months. If it's really annoying you, a stiff brush, clean water, and elbow grease is the best option. Proprietary cleaners and 'efflorescence removers' are, at best, temporary fixes but can improve the appearance in the short-term. Sealants are best left until the problem has cleared up. Complaining to suppliers, manufacturers or contractors is unlikely to achieve anything. The better companies and tradesmen do what they can to minimise the problem but it really is impossible to eliminate. If you think you've found a way to resolve the problem, either to clear it up once and for all, or to prevent it happening in the first place, you should contact me immediately and I'll tell you how we can share the fortune we'll make!